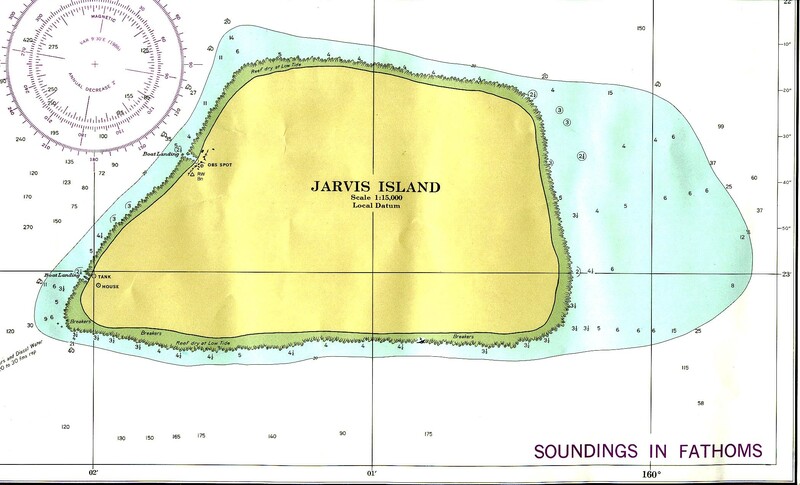 Discovered by British Captain Brown in 1821 who named it Jarvis Island after his employer. Whalers sometimes visited the island and noticed that it had reasonable guano deposits. Guano would attract the attention of the Americans and British over the rest of the Nineteenth Century. In 1856 the US government allowed American companies to take possession of any uninhabited lands for prospecting purposes. Two years later they landed on Jarvis and claimed it for themselves. They built some small buildings and established some morrings and exported guano for the next two decades. A few months later the U.S.S. St. Mary's under Commander Charles Henry Davis, surveyed the island and made formal claim in the name of the United States. February 27, 1858. C. H. Judd took 23 native workmen to Jarvis on the ship John Marshall, Capt. Pendleton, to commence digging operations. Buildings were erected and moorings laid. From 1858 to 1879 there is continuous record of guano shipments from Jarvis island, one of the most extensively exploited of the guano islands. However, the guano was exhausted by 1879. 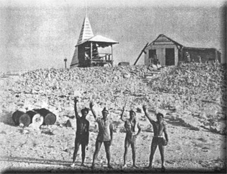 The British re-instituted their claim on the island in 1889. It was leased to a Phosphate company but there was little guano left to mine on the island. In 1913, a British coal ship struck the reef and promptly sank. The survivors were happy to see the the buildings but dismayed to see find that they were uninhabited. The lack of vegetation and water source meant that they had to embark on an epic journey to inhabited lands - finally finding solace on Danger Island where the Polynesians aided them and put them in touch with an American Naval ship. The strategic significance of islands like this increased significantly in the 1930s as long distance planes needed staging posts to help them traverse across the huge Pacific Ocean. There was also increasing weariness of the Japanese imperial designs. Strategically based islands were considered to be a vital asset. The Americans therefore decided to reassert their own claims again to the island by encouraging colonial settlement. For the most part, these colonists were a mix of enlisted military men and native Hawaiian youths. The colonists provided valuable meteorological observations in addition to substantiating their claim. Despite the American strategic planning, the island never was used as an airbase in World War Two. It was a little too far out of the main sphere of operations. However a Japanese submarine did actually bombard the colonists who were later evacuated for their own safety. It is currently a wildlife refuge.